Have you been discriminated against at work? A manager or co-worker has discriminated against you. Or, a supervisor has yelled racial epithets at you. Both common sense and your employer’s internal policies dictate that you report this illegal conduct to the Human Resources department immediately. What happens next can have a serious impact on your job and future at the company. It is important to know that how you go about reporting discrimination or harassment in the workplace is critical, and can determine whether you ultimately achieve justice or become a victim. The truth (and it is a hard truth) is that the Human Resources department is not your friend. You cannot and should not assume the good will of your HR rep. The purpose of the corporate Human Resources department is not to protect you, but to protect the interests and goals of management and the company. Make sure that when you report discrimination or unlawful harassment, you do so in a way that maximizes the protections afforded to you and places you in the best possible position if litigation later becomes necessary. Below, we’ll go over some simple do’s and don’ts when it comes to reporting discrimination or unlawful harassment to HR. DO report discrimination in writing. You should have evidence and proof that you in fact complained and reported the discriminatory conduct. The best way to do this is to put it in writing and have some type of confirmation that you submitted it. Employees who merely “call” the HR rep and have a verbal conversation alone are at a great disadvantage. What you reported, and even whether you reported anything at all, can then be in dispute. and what sort of injuries, emotional or physical, you suffered. As mentioned above, make sure you explicitly state what type of discrimination you are being subjected to. Under the law, in order to be protected from retaliation, you must make clear that you are reporting conduct that is a violation of specific anti-discrimination laws. Vague and general complaints about being treated “unfairly” or being “bullied” are NOT sufficient. If you don’t explicitly use the word “discrimination,” the company may argue that you did not complain of discrimination, and therefore that you have no protection from being terminated for your complaint. DO be concise in your written complaint. Don’t write an overly long or rambling tome that goes off on tangents and vents on every little slight or on minor issues that are unrelated to the specific discrimination you are complaining about. You want to solidify an impression of seriousness and credibility. You do not want to create an appearance of simply being disgruntled or generally dissatisfied with your overall lot in the company. Keep your written complaint straightforward and focused. DO keep record of your communications with HR. 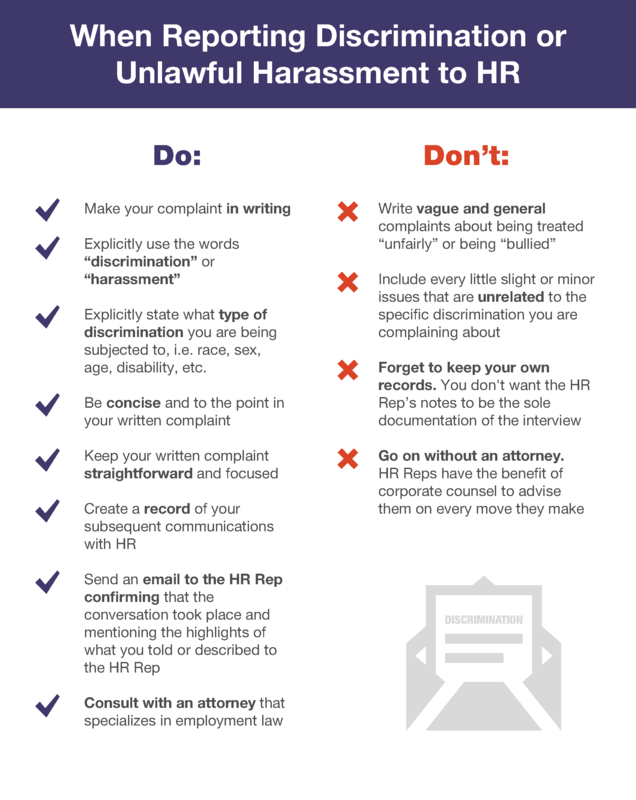 After you submit a written complaint of discrimination, it is likely that a HR rep will contact you and interview you. The HR rep will take notes of the conversation. However, you don’t want the HR rep’s notes to be the sole documentation of the interview. Usually, the best way to document the conversation is to send an email to the HR rep confirming that the conversation took place and mentioning the highlights of what you told or described to the HR rep.
DO consult with an attorney who specializes in employment law. Your company’s HR reps have access to and the benefit of corporate counsel to advise them on every move they make. There is no reason to go it alone when your job environment and security are at stake. For example, you can have a draft of your written complaint of discrimination reviewed by an attorney before you send it. In some cases, it might be best to have the attorney write and make the complaint directly on your behalf. A few minutes of consultation with an attorney can make all the difference in an important, perhaps life-changing, professional decision. Zatuchni & Associates specializes in discrimination claims across all protected categories. We’ve helped countless clients who have suffered workplace bias secure financial and legal compensation from their employers. If you have discriminated or harasses at your workplace, contact our experienced employment attorneys online or call 609-243-0300 today for a free consultation. Our attorneys represent New Jersey and New York employees. I work for a medical company in Boston Ma, I feel that I’m having some discrimination towards me on my job that’s is mentally, emotionally and physically affecting me. I need some legal advise on what is happening, please email me with any information I can obtain in regards to seeking legal counseling or please refer me to another agency that may help me with my case. I work for a medical device company and believe I am experiencing gender discrimination in the work place. It is mentally and physically affecting me. I am interested in legal advice in employment law. I currently work as an aerospace engineer in the UK for a large american firm, recently (two weeks ago) the pay rise announcements were made, these pay rises were performance based, my colleagues received higher pay rises from the company than I did, the reason behind this was not because my work was in any way less than any of the other workers it was because of my absenteeism, now it is true that i have had all together around 4 weeks of in 2017, however i do have three very good reasons as to why 1) i have a tumour in my spine which was diagnosed in August 2017, iv’e had to have surgery to help with the pain, the company i work for have done nothing to help the situation at all, iv’e asked for reduced hours, or a desk job…both have been outright refused with no explanation, i have provided hospital letters, operation details from the neurosurgeon, G.P letters, occupational health letters and it counts for absolutely nothing! 2) I have a severe form of bi-polar effective disorder and i have to see my psychiatrist ever 3 months for medication reviews 3) my youngest daughter has been severely ill with mental illness, she was sectioned 18 months ago, she was subsequently diagnosed with Asperger’s and the same severe type of rapid cycling bipolar affective disorder. The company i work for have no discretion at all in my special circumstances, just because i am ill and have a mentally ill child i’m to be denied a pay rise equal to my colleagues, how do i go about the first stage of complaining to the company? Any help, guidance or information would be greatly appreciated. I was terminated from Walmart in fort mohave Arizona because what I said to my other co workers on break about this person and they told him so I got fired but this person did not hear me. He told the boss and I got fired. I work with a newly appointed supervisor who has had 3 people fired and 2 people quit in the last year and a half. The last 2 months or so she has stopped communicating with me, being very passive aggressive with her comments, avoiding me and when I approach her with questions or ask her advice, i am given the comment you should know this or ask someone else. She has started doing my work for me. If I make any mistakes it is a huge deal and it is brought to management’s attention even though I have requested training multiple times. I am constantly stressed and have high anxiety in my workplace, I see a psychiatrist and psychologist and have had severe migraines due to her treatment towards me. She does not do this to anyone else in our office. I feel like I am being singled out and set up to fail. I am in fear of losing my job and I love working where I am currently. Do you have any suggestions?